IT’S HARD TO BE ANGRY WITH ANY TREND THAT MAKES PHOTOGRAPHY MORE DEMOCRATIC, or puts cameras into more hands. Getting more voices in the global conversation of image-making is generally a great things. However, it comes with a price, one which may make many people actually give up or stagnate in their growth as photographers. We may be killing ourselves, or at least our art, with convenience. Cameras, especially in mobile devices, have exponentially grown in ease (and acuity) of use over the last fifty years, but they are actually teaching people less and less about what, technically, is happening in the making of an image. The nearly intuitive logic of smaller and easier cameras means that many people, while busily snapping away and producing billions of pictures, are being more and more estranged from any real knowledge of how it’s all being done. This is a vicious circle, since it guarantees that a greater number of us will be more and more dependent upon our cameras to make the bulk of the creative decisions for us, more obliged to accept what the camera decides to give us. In some very real way, we are being shortchanged by never having had to work with a garbage camera. Let me explain that. Being forced to do creative work with an unyielding or primitive tool puts the responsibility for (and control of) the art back on the artist. Those who began their shooting careers with limited box cameras understand this already. If you start making pictures with a device that is too limited or “dumb” to do your bidding, then you have to devise work-arounds to get results. That means you learn more about what light does. You learn what ideal or adverse conditions look like. You see what failure is, and begin to dissect what didn’t work for a stronger understanding of what may work next time. You learn to ride a bike without training wheels, and thus never need them. 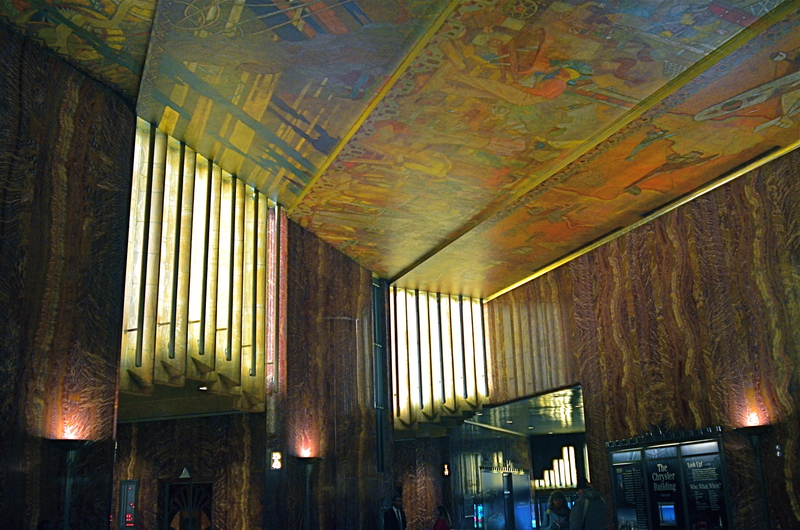 The dark lobby of New York’s Chrysler building: An extremely challenging setting for low-light photography. I screwed this up on a cosmic scale, but I learned a ton. Shooting on automodes, I would have learned precisely…nothing. And the picture still would have stunk. The above image, taken on manual settings in a less-than-ideal setting, has about a dozen things wrong with it, but the mistakes are all my mistakes, so they retain their instructive power. If something was blown, I know how it can be corrected, since I’m the one who blew it. There is a clear linear learning process that benefits from making bad pictures. And if my camera had done everything itself and the picture still reeked, then I’d be stuck with both failure and ignorance. Cameras that remove the risk of failure also remove the chance of accidental discovery. If you always get acceptable images, you’re less likely to ask what lies beyond….what, in effect, could be better. You accept mediocrity as a baseline of quality. And editing tools that consist mostly of corrective solutions, from straightening to sharpening, keep you from addressing those errors in the camera, and that, too, robs you of valuable experience. Convenience, in any art medium, can either abet or prevent excellence. The amount of curiosity and hunger in the individual is the decisive factor in moving from taking to making pictures. For my money, if you’re going to grind out the process of becoming an artist, you can’t rely on equipment that is designed to protect you from yourself. This entry was posted on May 25, 2016 by Michael Perkins. It was filed under Conception, Experimentation, Exposure, Light, Point-and-shoot and was tagged with automodes, Manual Exposure, Style, Technique.